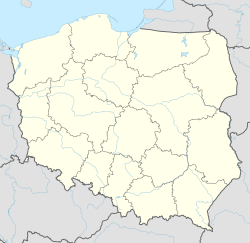 For other places with the same name, see Pruszków (disambiguation). Pruszków [ˈpruʂkuf] ( listen) (Yiddish: ‏פּרושקאָוו‎‎) is a city in central Poland, situated in the Masovian Voivodeship since 1999. It was previously in Warszawa Voivodeship (1975–1998). Pruszków is the capital of Pruszków County, located along the western edge of the Warsaw urban area. The town's population has grown significantly, from 16,000 in the early part of the 20th century to 60,068 in the 2014 census by the Central Statistical Office of Poland. Pruszków was incorporated as a town in 1916 following World War I, although a village has existed there since the 16th century. The development of the town was aided by the construction of the Warsaw-Vienna Railway in the 19th Century and the construction of the Elektryczna Kolej Dojazdowa (now Warszawska Kolej Dojazdowa), Poland’s first electrified commuter train line, in 1927. A large psychiatric hospital opened in the outlying village of Tworki in 1891 and is still operating to this day. During the World War I, a battle between German and Russian forces took place in Pruszków on 12–18 October 1914 (part of Battle of the Vistula River). Despite the initial success of the German forces on 12 October, they were push-backed out of town after successful Russian counter-attack on 14th. An intense artillery fire by both sides caused severe damages to many buildings in Pruszków including train station, power plant, and two churches. In August 1915 Pruszków was taken by the German forces without a fight. The city had a large Jewish population before the Nazi–Soviet Invasion of Poland. In 1940, the German occupation authorities established a Jewish ghetto in Pruszków, in order to confine its Jewish population for the purpose of persecution and exploitation. The ghetto was liquidated on January 31, 1941, when all its 1,400–3,000 inhabitants were transported in cattle trucks to Warsaw Ghetto, the largest ghetto in all of Nazi occupied Europe with over 400,000 Jews crammed into an area of 1.3 square miles (3.4 km2). From there, most victims were sent to Treblinka extermination camp. During the 1944 Warsaw Uprising, the Nazis created a large transit camp (Durchgangslager) in Pruszków on the site of the Train Repair Shops (Zakłady Naprawcze Taboru Kolejowego) to intern the evacuees expelled from the capital. Around 550,000 Warsaw residents and approximately 100,000 more from its outskirts were incarcerated in the Durchgangslager 121 (Dulag 121) set up for this purpose. The SS and Gestapo segregated the victims before transport. Approximately 650,000 Poles passed through the Pruszków camp in August, September and October 1944. Approximately 55,000 were sent to concentration camps, including 13,000 to Auschwitz. They included people from a variety of social classes and occupations (government officials, scholars, artists, physicians, merchants, and blue-collar workers), in varying physical conditions (the injured, the sick, invalids, and pregnant women), and of various ages from infants only a few weeks old to the elderly, aged 86 or more. In a few cases, these were also people of different ethnic backgrounds including Jews living on "Aryan papers." Following the Soviet westward offensive, on March 26, 1945, the 16 members of the Polish Underground Government were invited by the Russians for talks, to a house in Pruszków on Armii Krajowej Street. They were captured by the Soviet NKVD agents, transported to USSR, imprisoned, tortured and sentenced in Moscow during the so-called Trial of the Sixteen. After World War II, Pruszków became one of Masovia’s largest industrial centers. Due to its proximity to Warsaw, it is now home to several factories and companies, including Herbapol, Daewoo Electronics, L'Oréal Cosmetics as well as logistic centers. It is also an important sports center, with a sports gymnasium, soccer stadium and a cycling course. Since 2007 the local football team, Znicz Pruszków competed in the Polish First League (second division) for three seazons, but was moved to the Polish Second League (third division) in 2010. Robert Lewandowski played in Znicz since 2006 to 2008, while Jacek Gmoch, who was born in Pruszków in 1939, played in Znicz since 1953 to 1958. Former Polish president Bronisław Komorowski spent part of his childhood in Pruszków. Nineteenth century manor with landscaped gardens. 256 metres tall chimney of former "Pruszków II Power Plant", now used as radio tower. ^ "Central Statistical Office (Poland), Ludność. Stan i struktura w przekroju terytorialnym" (PDF). ^ The statistical data compiled on the basis of "Glossary of 2,077 Jewish towns in Poland" Archived 8 February 2016 at the Wayback Machine by Virtual Shtetl Museum of the History of the Polish Jews (in English), as well as "Getta Żydowskie," by Gedeon, (in Polish) and "Ghetto List" by Michael Peters at www.deathcamps.org/occupation/ghettolist.htm (in English). Accessed July 12, 2011. ^ Księga Pamięci. Transporty Polaków z Warszawy do KL Auschwitz 1940-1944 (Memorial Book: Transports of Poles from Warsaw to Auschwitz Concentration Camp 1940-1944. Archived 26 August 2011 at the Wayback Machine Auschwitz-Birkenau Museum. On the Sixtieth Anniversary of the Warsaw Uprising. Accessed July 13, 2011. ^ "Bajka o Robercie Lewandowskim". Sport.pl (in Polish). Retrieved 14 February 2016. Wikimedia Commons has media related to Pruszków.